Honestly, I don’t know what else to call this post. 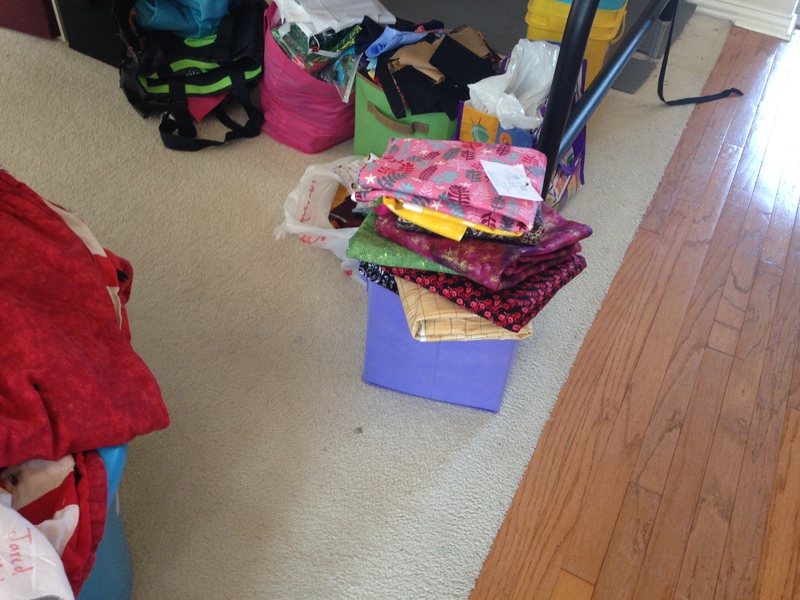 I mean seriously, I have SO MUCH fabric, and yet I seem to have to buy more for projects, backings, borders, customers, various other excuses… uh I mean REASONS. Legit reasons! So anyway, here’s the problem (I think): I see the amazing and vast potential of every fabric I find, and I see what it could ultimately become. But I don’t have the time to actually execute the idea I have about the fabric. I make it a point to go on as many retreats as possible. I made it to only one last year (very busy year), and have made it to three this year, so far, and have two more planned. Wait, make that four already – forgot about the one I was invited to last minute in AZ. Anyway, I have been to some retreats that were not well, um…. well appointed. I.e. one ironing station for 12 people, two cutting stations for 20. See what I mean? So I prep before going to a retreat so WHEN I GO TO THE RETREAT, I sit and sew and sew and sew. I don’t have to stop production waiting for the iron or cutting table. I precut most of what I can to be prepared to just GO. Which means I complete A LOT. I usually finish 4-8 tops (mostly not bordered tho) at a weekend retreat. 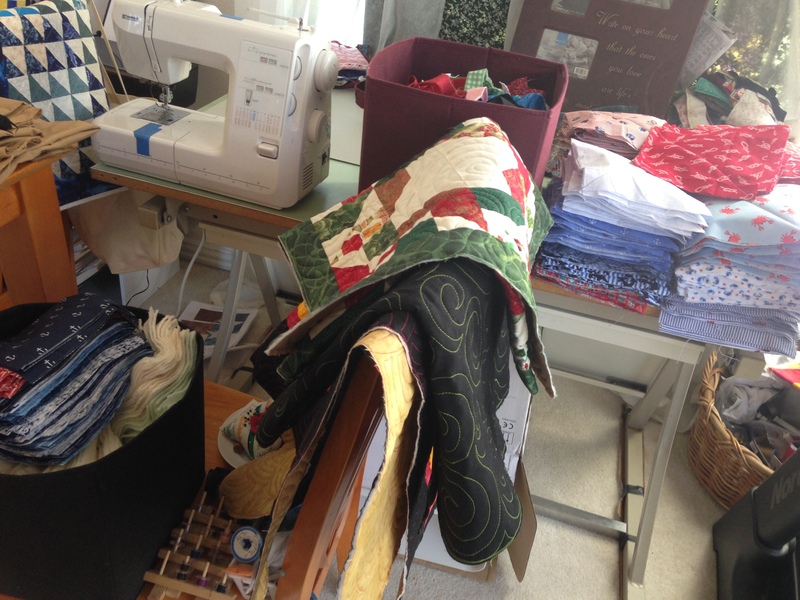 Then there is the stack of quilts that HAVE borders attached. Then the quilts that are ready, WITH backing prepared for them. 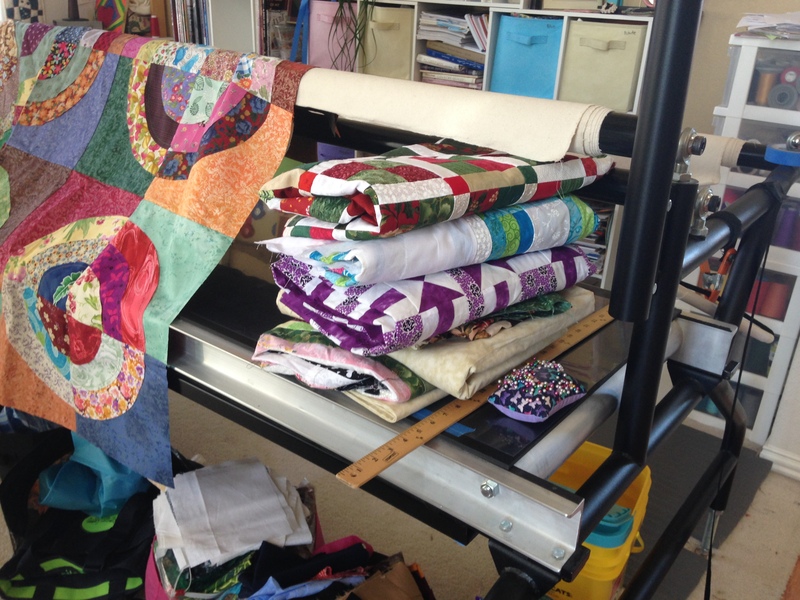 And then the quilts that I somehow actually got quilted, that now just need to be bound. 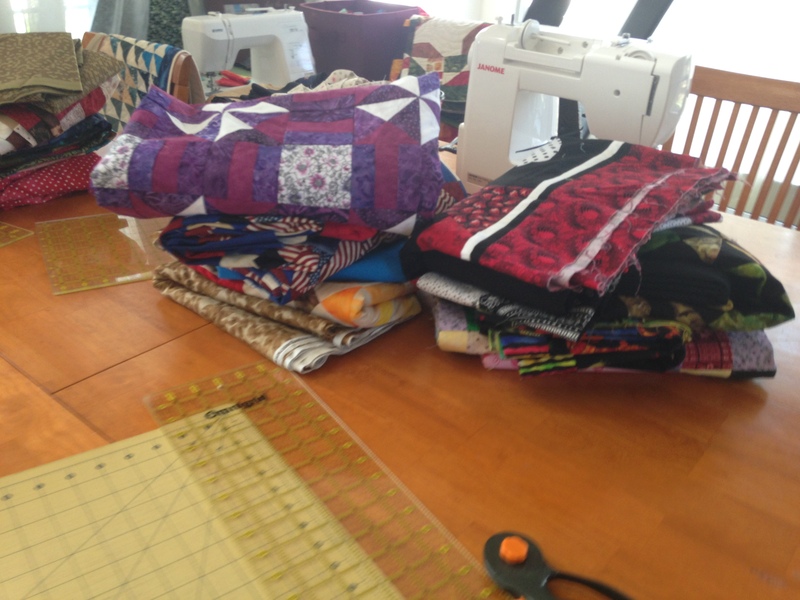 First count I had about 8 needing borders, 5 needing backs, 15 needing quilting and 4 needing binding. I got 2 quilted, 5 bound and 3 with borders attached. Which leaves me with 5 needing borders, still 5 needing backs (because I matched a few more up), 17? needing quilting and one still needing to be bound. 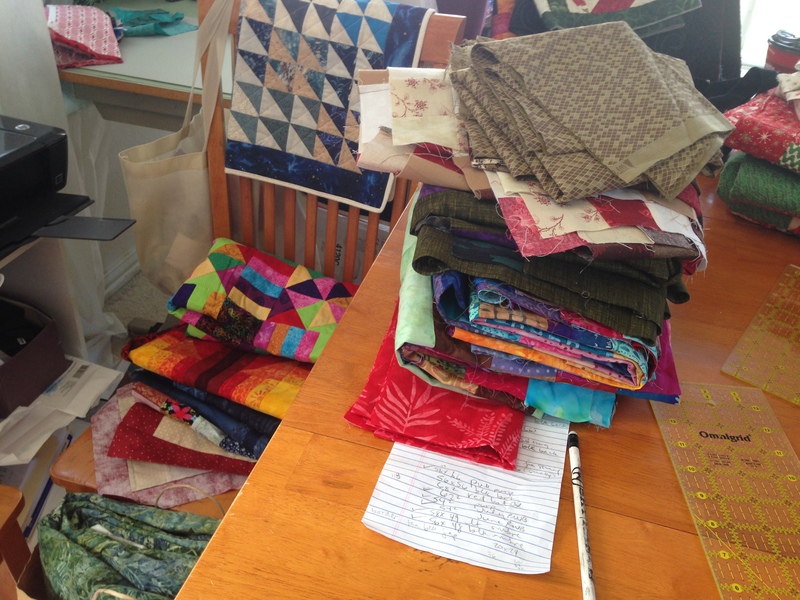 Honestly the problem is that I am a long arm quilter by trade, so everyone else’s quilt gets top priority over mine (including any charity for the guild or QOV). So I just rarely quilt my own projects! And to think, I’m heading to retreat Friday morning to create more tops! OI VEY! 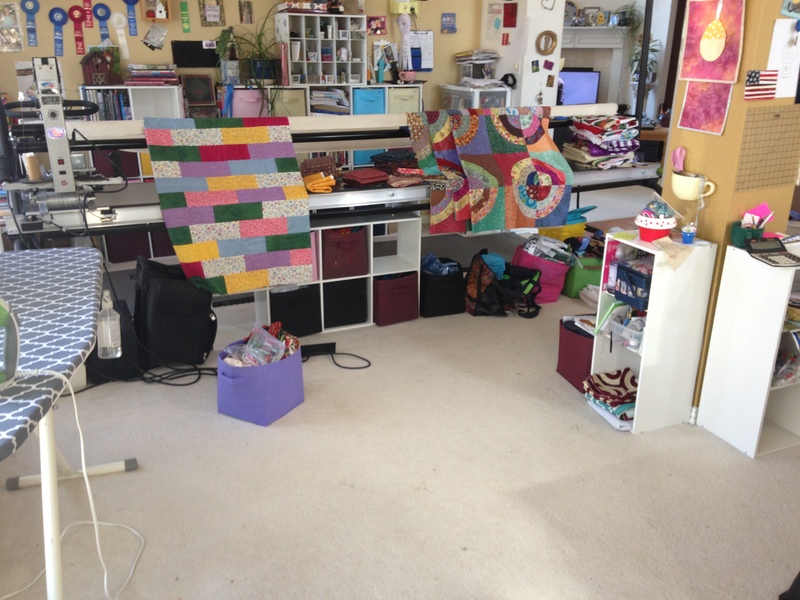 This entry was posted in business, inspiration, personal, quilt making, quilt preparation, quilting and tagged fabric, quilt making, quilt photos, quilt top, quilting, quilting inspiration, quilts.